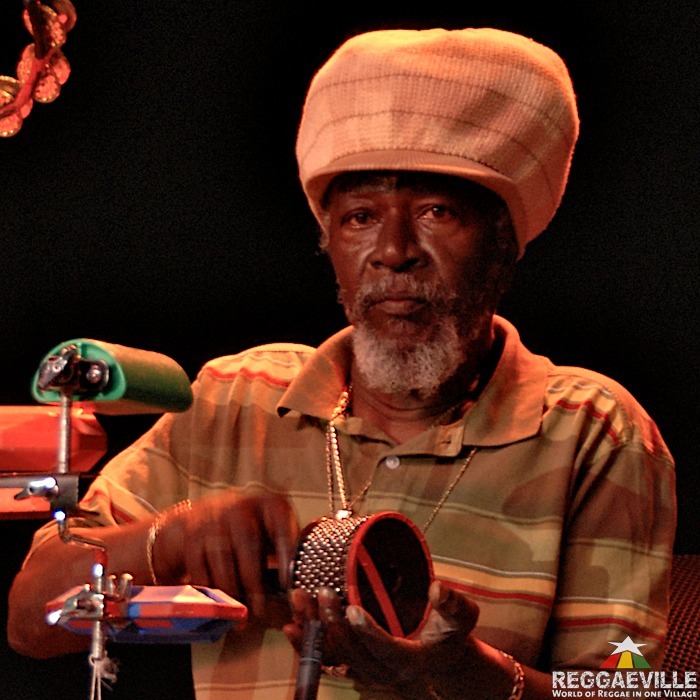 When looking at the performance history of drummer Carlton ‘Santa’ Davis, it’s hard to find a path of a reggae artist he hasn’t crossed in the past 40 years, including legends Peter Tosh, Jimmy Cliff, Mighty Diamonds, and Burning Spear, to name just a few. 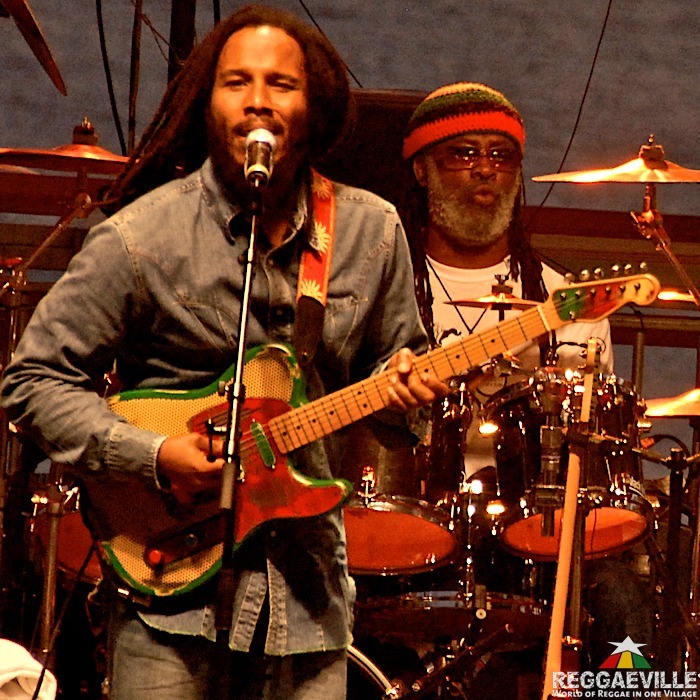 Currently the timekeeper anchors Ziggy Marley’s band, a spot he’s held for over a decade. We spoke with Davis at his home studio in Los Angeles days before he embarked on Marley’s summer tour. How much rehearsal does Ziggy do before a tour? Basically, it’s a bunch of professional musicians. With Zig, he feels confident enough to rehearse just before. Back in the day, he used to do a week, two weeks. Because we’re so accustomed to the songs, because we’re so accustomed to the changes that he would make from time to time, we’ll do a two or three-day rehearsal. Is the rehearsal a refresher? To make changes to songs and bring in new ones? A combination. He’s always improvising. He’s always doing things to make the song more interesting. Normal groups would just do the song the same way over and over. Is that also a chance for you or the others to make suggestions? He pretty much knows what he wants, but sometime if somebody suggests something, he might say, ‘Ah, let’s try that.’ If it works, it works. If it doesn’t- back to the way it was before. What’s the relationship with Ziggy? You are his drummer until you are not? I’m Ziggy’s drummer until I’m no longer his drummer. You can put it like that. I’m not contracted to him. If I want to go somewhere, it’s up to me. He could get somebody else easy. I still make this a commitment. I’ve been working with them since 2002. I’m just playing music. I’m not thinking about a contract thing. We work for hire but, I give Ziggy the priority. I was here and he was getting ready to do a tour and needed a drummer. Did you think that was the start of 11 years with him? No. Ziggy wanted me to do that tour but didn’t know what would happen after that. That was the time he started his first solo project Dragonfly. I’ve been there ever since. When you are performing a song like Is This Love? and you are not the drummer on the original, what is your approach to playing? My thing with music is if a song was played a certain way I’m going to have total respect for what the drummer did. I’m going to try and bring the song as close as possible to that level, but I’m also going to still do me. I’m going to show appreciation. It’s just respect for the other person’s work. I could come and play an open snare on Is This Love? but it wouldn’t be the same as doing it with a side stick. To me it is respecting what is there. That is what created that whole feel, the whole atmosphere. Are you trying to copy the licks? Play the same fills in the same places? People like Sly Dunbar or Carly Barrett - God rest his soul - I have great respect for those guys. If I’m in a position where I’m going to play a song that they recorded I’m going to show full respect, but you’re going to hear me. I don’t like copying the licks. Musicians coming from Jamaica, once they hear a song, okay, you know where it’s at. The overall feel, you have to capture that. Did you find reggae or did it find you? Reggae music found me. I grew up in that sound system kind of thing. Every weekend you had sound systems that used to play- like Coxsone in Studio One, he had his sound system. Treasure Isle with Duke Reid. King Tubby, of course. All these different people. As a kid growing up you couldn’t help but be in the middle of that. There were dance halls, venues that people would rent every weekend. I used to live in Greenwich Town and right where I lived there were three dance halls that surrounded me. Can you imagine on a weekend all three? It was just this battle, you know what I mean? Right back to the morning. People used to cry about noise because it was like a holiday, but it was good for everybody. You couldn’t help but be a part of that. Did it make you want to be a musician? My whole entry into the thing…, I didn’t realize I was going to be a professional musician. When I was going to school I joined a drum corps. At 11 years-old I was playing snare drum, tenor, bass drum, cymbal. I was a flag bearer, rifle bearer, everything. But it was a kid-thing. Something to keep me occupied so that after school, after chores, it was band practice, back home, and get ready for school the next day. I had a routine which was good because there was so much crap you could get mixed up into. How much does being from Jamaica matter when it comes to playing reggae? It matters a lot. Reggae is a Jamaican product in a sense that it is kind of like a way of life; the way people move, the way people talk. It’s part of our culture. You dance a certain way. The music just comes out that way. Originally the whole thing is coming from Africa, the whole rhythmic thing. Is it harder for someone not from Jamaica to understand it? It’s feel. Reggae music is all about feel. It can be laid-back. It can be up-tempo. It can be mid-tempo. It can be any way you want it. Reggae music is freedom. We had a great guitar player by the name of Lynn Taitt who came from Trinidad. He created a lot of the rocksteady licks. It doesn’t matter where you come from. It’s something you feel deep inside. But it’s not too simple, is it? Reggae still has a difficult time competing with more commercial styles of music. The big cats look at it like, ‘It’s little island music with two chords and no big arrangements.’ Reggae music is friendly music to all genres music of music. When Bob Marley decided to add R&B or a bluesy flavor with guitars and all those things, a lot of people in Jamaica were wondering, ‘Is Bob switching to something else?’ No. He was broadening the music. You’ve done a lot of session work in your career, but recently have been touring more? Do you have a preference? I like both equally. Back in Jamaica, from the early ‘70s, I was a studio musician and also worked in the clubs. I had the best of both worlds. When I was doing the club thing I would look around to see what the people are dancing to. The girls in Jamaica, they dance off the bass line. I love playing live. I love seeing that reaction, that exchange of vibe. Are you still looking at the crowd when you play? I still look at people. I take sound and rhythm from a bunch of different things. Everything is music. In Jamaica they had these diesel trucks, and when they were idling had a rhythm. I would sit and try to figure out the time signature as that truck is idling. Or maybe the sound of raindrops hitting the zinc roof. I would listen to stuff like that. A few years back ‘Sticky’ Thompson was playing percussion with the band. How was that for you? ‘Sticky,’ to me, pound for pound, beat for beat, rhythm for rhythm, is one of the best percussionists I’ve ever worked with. ‘Stick’ has this knack of finding the open spaces. When you work with ‘Sticky’ you can close your eyes. He knows when to hit and when not to hit. When it isn’t someone like ‘Sticky,’ what about a percussionist is a challenge? When a percussion player is trying to play my rhythm, that’s when I have a problem with it. A lot of people try and fill every space. Music is not about filling every space. Sometimes you have to leave it open. What has the rise of technology, particularly samples and digital drums, meant to you? Technology has been around for ages. When drum machines came to Jamaica, all the drummers ran and bought them. I was one of the last dudes to buy one. I think I programmed, like, four or five songs. I thought, ‘There is something wrong about this.’ I’m not going to be a drummer that’s sitting programming a machine. Sly did it and made millions. He would always say, ‘Man, don’t you want to?” I’d say, ‘No. Even to my peril I want to stick to the real deal.’ I know technology is here to stay. There is nothing I can do about it. A lot of guys feel threatened, surely it has messed up a lot of guys, but the thing is this- be true to what you are. Let the drum be the drum. What concerns you about the music being made by today’s new artists?